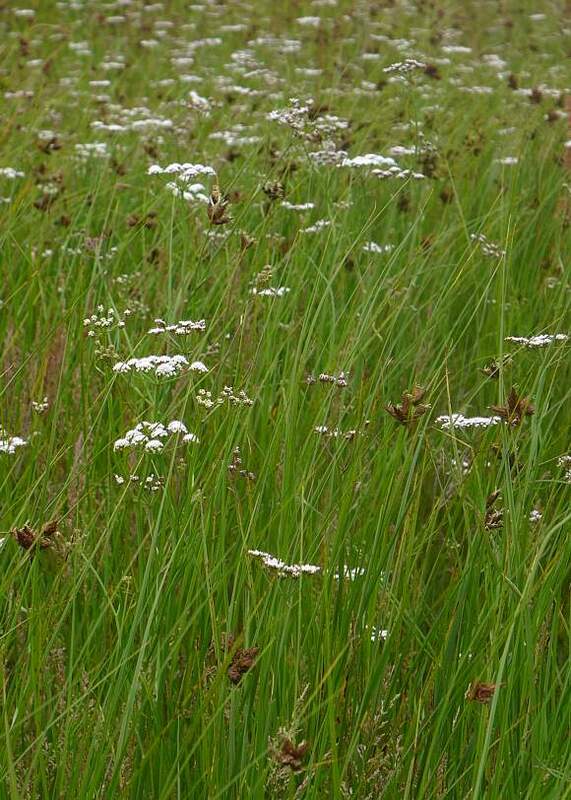 Grows to 1m high on brackish marshy salt-plains, as well as some other wet mainly-coastal places. Stems thinner than most other Water-dropworts. 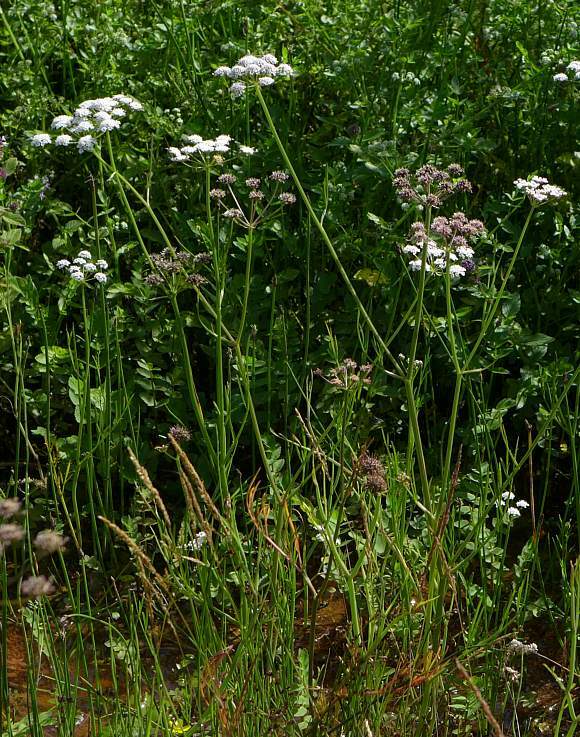 The tall plants with the white flowers and purplish fruits are the Parsley Water-dropworts; the rest ar, as Eddie Cochrane says, "Somethin' Else"! 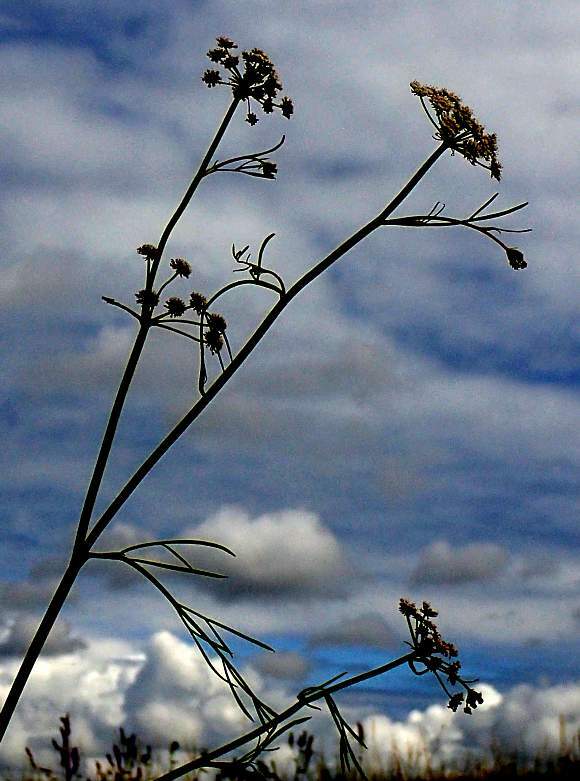 Has but few, about 6-8, umbels. 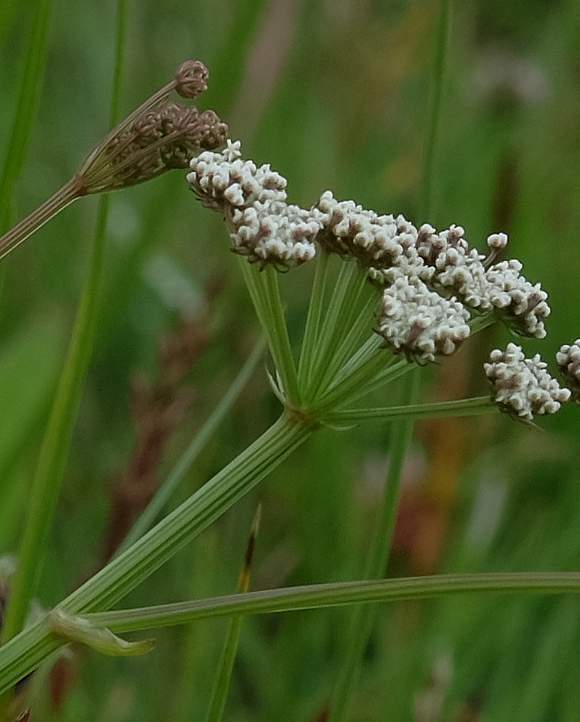 White flowers in compound umbels 50-60mm across. 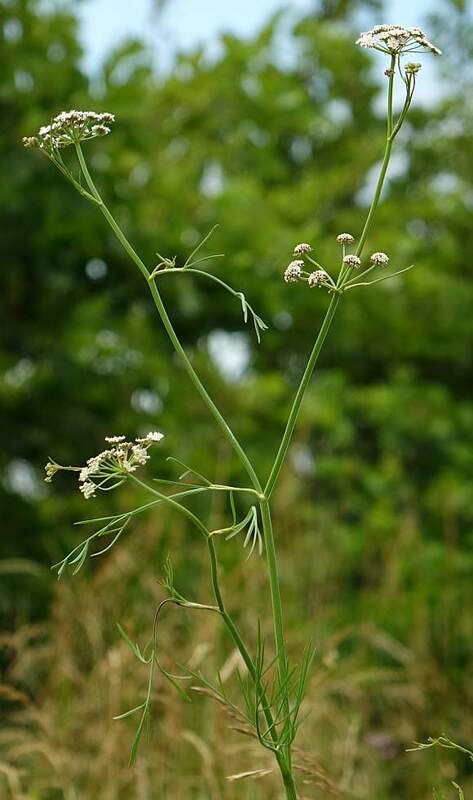 Leaves very narrow and pinnate similar to those of Tubular Water-Dropwort. Plant is hairless. Bracts beneath umbels number between none to five and are short if present. Flowers not yet fully opened on this umbel. 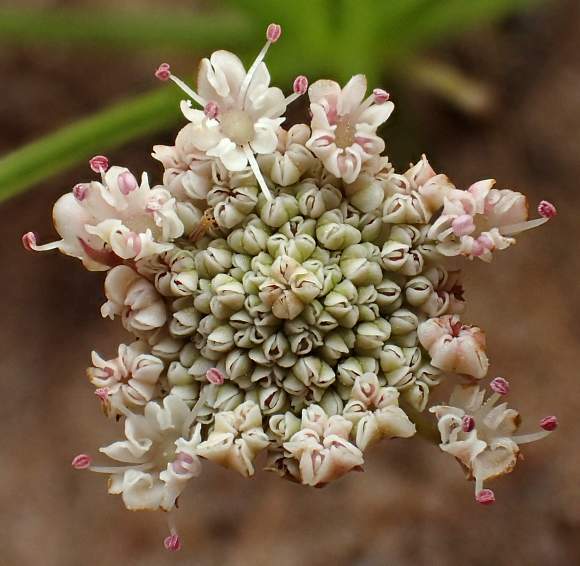 Flowers may have a pink tinge when only partially open. Some florets on the periphery may have flower stalks which project outwards sideways clear of the florets nearer the middle. Unopened florets. 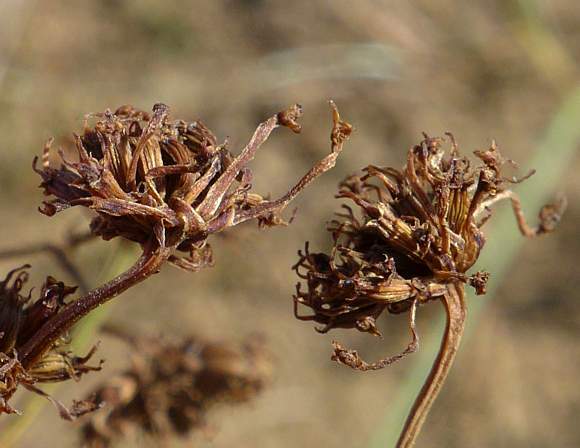 Pale brown bits may be sepals. Central flowers pale-greenish when still un-opened. Un-opened flowers with their pale-greenish tinge. 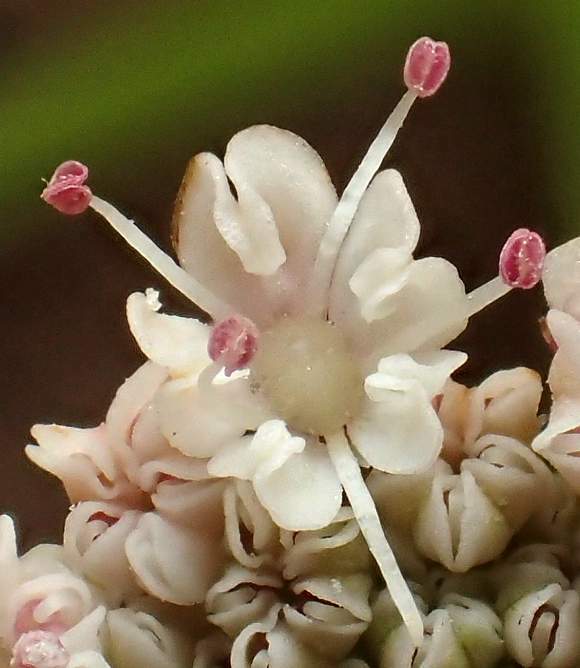 Opened flowers on the periphery displaying 5 stamens with reddish anthers. Half-opened florets. Those near the centre never fully open. The pinkish tinge is due in part to the pink anthers and to a lesser extent the slightly pink folded-up petals. 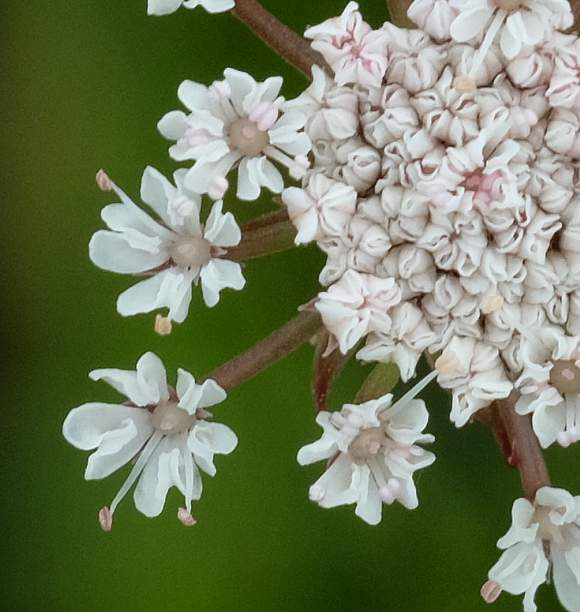 Fully opened and larger florets around the periphery of each umbel displaying noticeable zygomorphism with larger petals on the outside. Petals have nicks in them. Anthers red, but pollen probably white, resulting in a pink coloration (for now). Petals may be very pale pink until fully opened. Five stamens with deep-red anthers (dropped off on lowest filament). 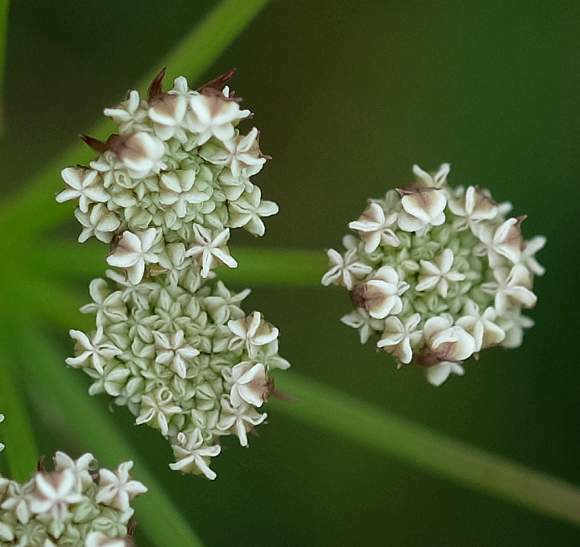 The largest petals appear to be notched, but are not actually; they have a fold in the middle taking up the excess width (this is typical for those Umbellifers where the petals get large at the periphery, but not all umbellifers exhibit this characteristic. 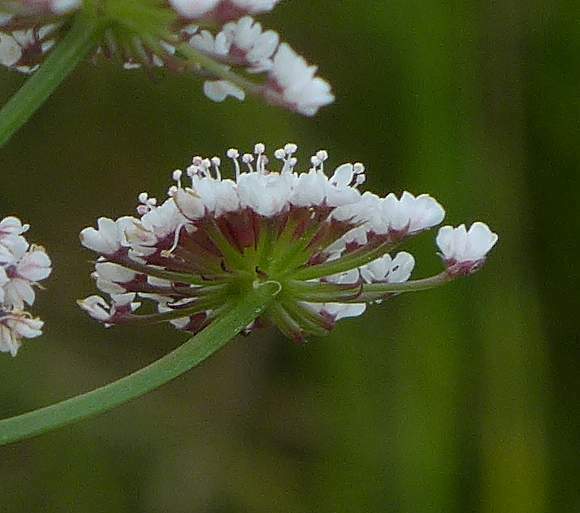 Brownish-red and toothed sepal teeth beneath each floret are present here (but may be absent as they are on many other umbellifers or occur only sporadically). 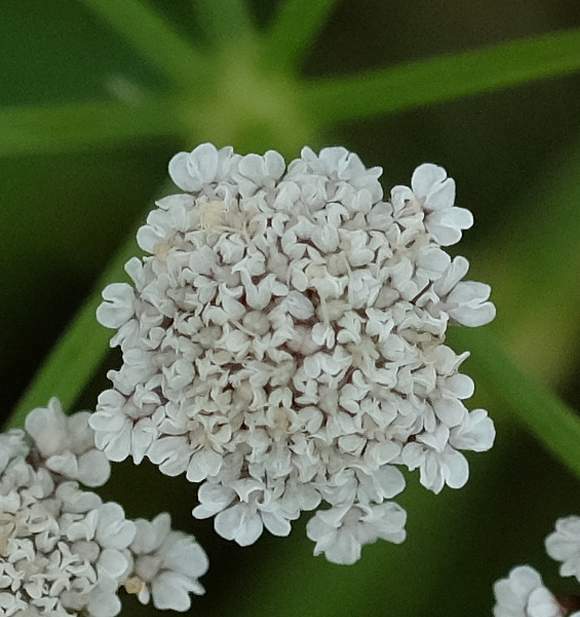 Stamens with white pollen still present protrude above the flowers. Stems grey-green and ribbed but hairless. 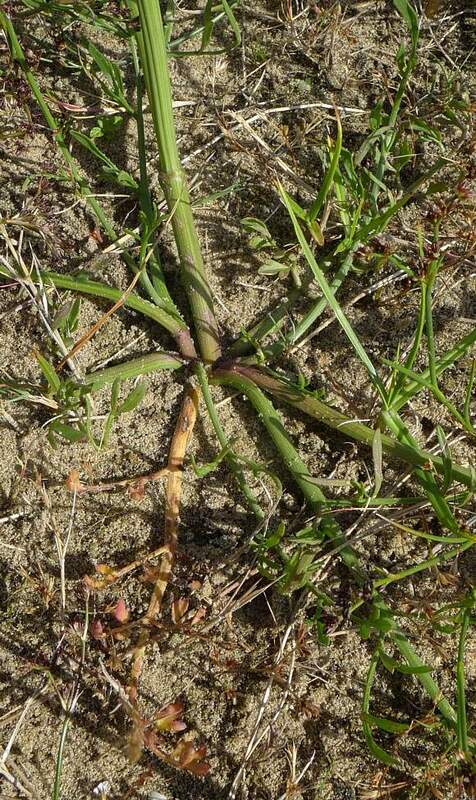 Stems usually solid with thick walls and a pity centre (although some specimens are hollow). 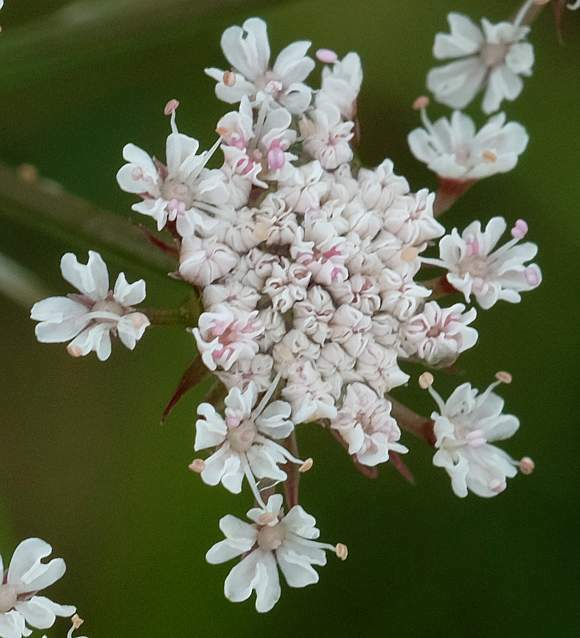 Beneath each sub-umbel are a multitude of pointed linear bracts with reddened tips. Upper leaves are 1 to 3-pinnate, with linear to long-ovate leaflets. [Lower leaves (not shown) are slightly wider and elliptical]. Leaflets here tipped purple, but this is not an ID feature. 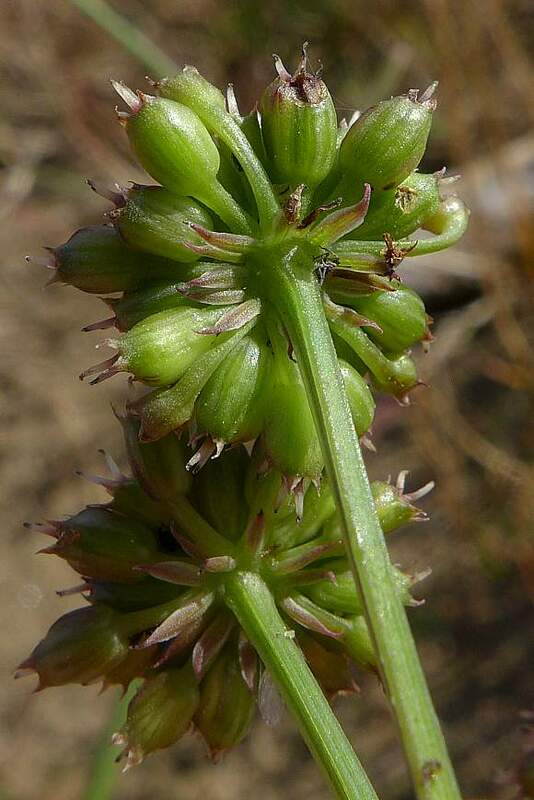 The fruits are 2.5 to 3mm long, ovoidal, broader near the top, with prominent slender ridges and with styles either divergent or recurved and shorter than the fruit. 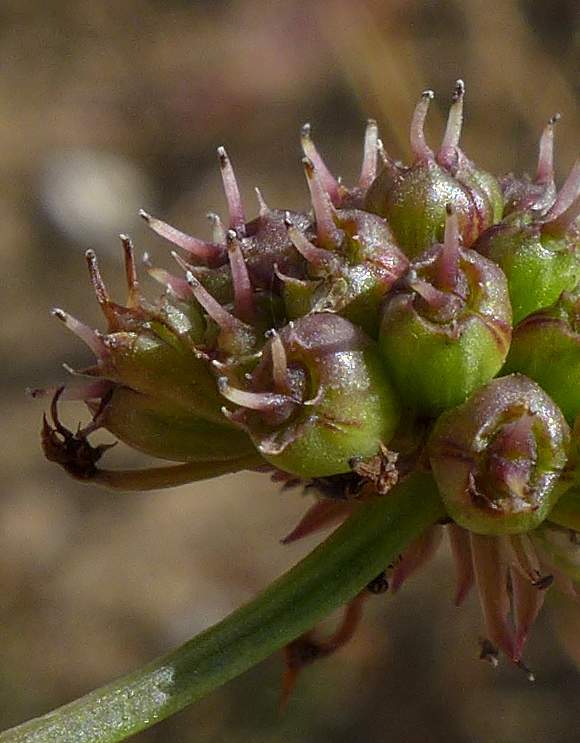 The fruits are a different shape to most other Water-dropworts, being ovoidal. Also, the two styles are bow-legged, initially divergent but curving inwards - but some can also be divergent. The stylopodium is also not prominent, but rather recessed a bit. Also, the teeth around the edge of the fruit are very short and stubby. 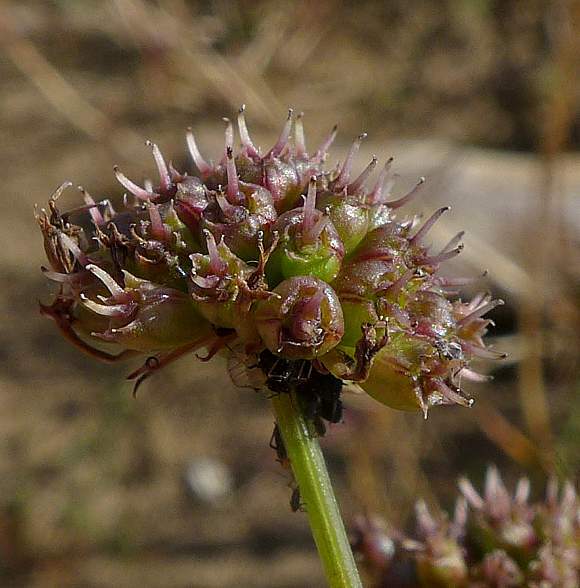 The bracts beneath the umbellets taper to a reddish point. The fruits well and truly baked. Your Author thinks that there is only one main stem; the rest which are radiatingh outwards flat on the ground are branches bearing leaves, two of which can be seen in picture going north and south, with the one going south looking like it is suffering drought conditions. He is not sure if this is typical, or not - maybe it has been half buried by wind-blown sand - also: this specimen is not standing in shallow water or moist soils. 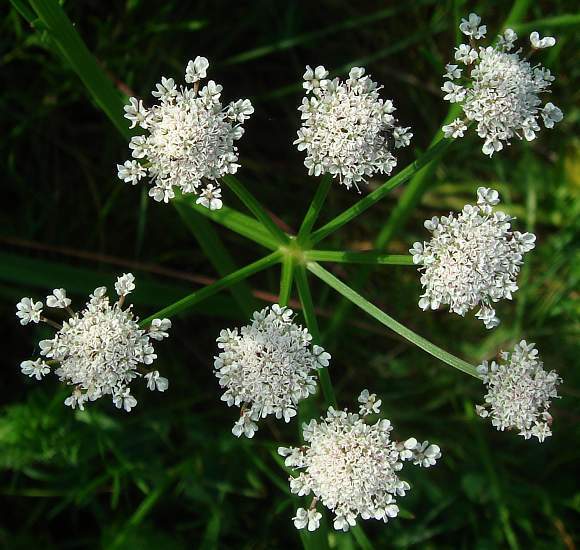 Not to be semantically confused with : Great Water-parsnip (Sium latifolium nor with Wild Parsnip (Pastinaca sativa) nor with Parsley Water-dropwort ((Oenanthe lachenalii) nor with Garden Parsley (Petroselinum crispum) nor with Milk-parsley (Thyselium palustre) nor with Fools Parsley (Aethusa cynapium), Cow Parsley (Anthriscus sylvestris), Upright Hedge-Parsley (Torilis japonica), Stone Parsley (Sison amonum), Corn Parsley (Petroselinum segetum) [all plants with similar names belonging to the same Umbellifer Family (Apiaceae)]. 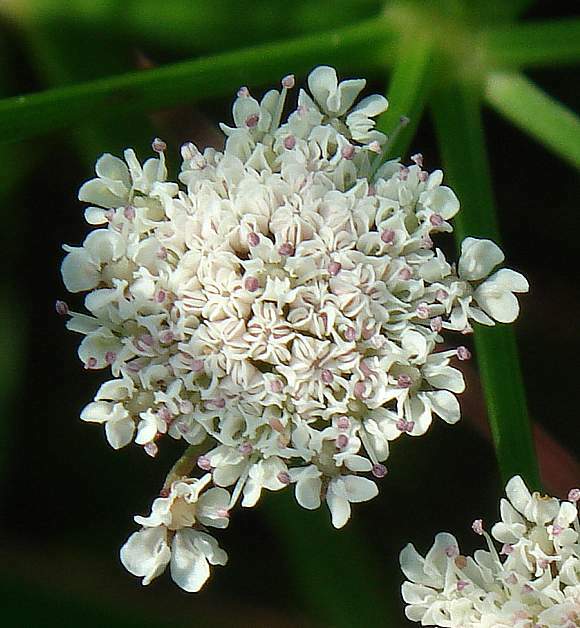 No relation to : Dropwort (Filipendula vulgaris) [a plant with similar name belonging instead to the Rose Family]. 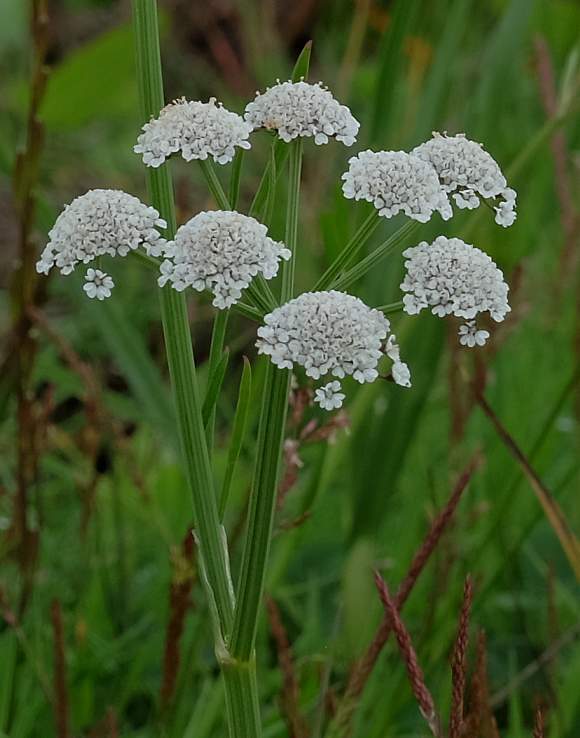 Slight resemblance to : the quite rare [RR] Narrow-leaved Water-dropwort (Oenanthe silaifolia), which similarly grows to only 1m high and has narrow leaves which are between 1-pinnate to 4-pinnate. 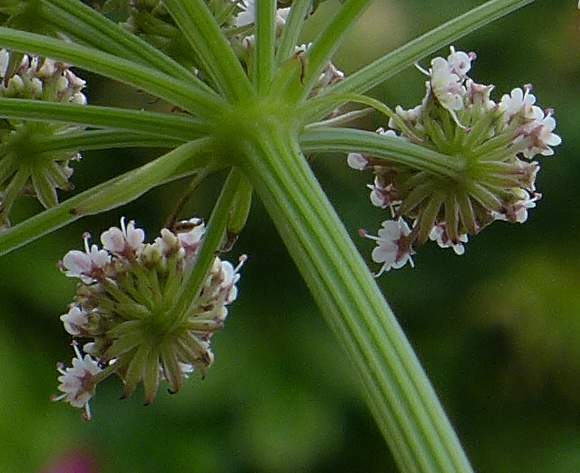 Also, this has hollow stems [whereas Parsley Water-dropwort solid (but with a pith)]. 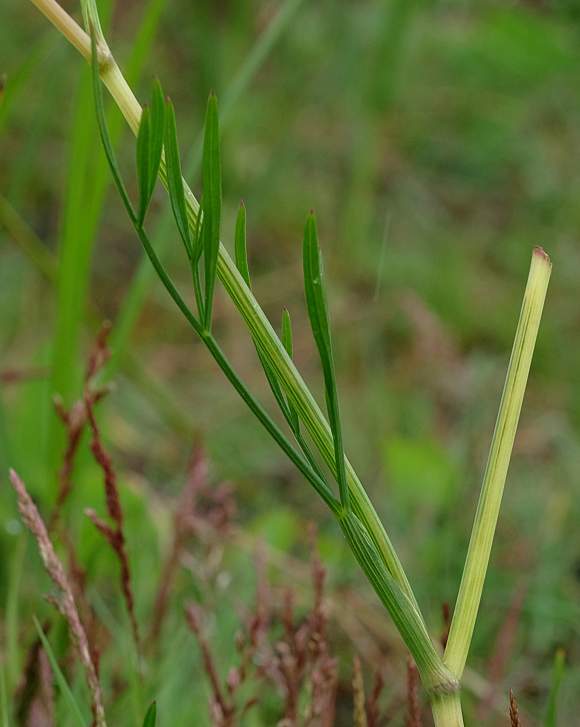 Distinguishing Feature : The long and narrow leaflets (which are part of the leaves which are 1-3 pinnate) but sparse. 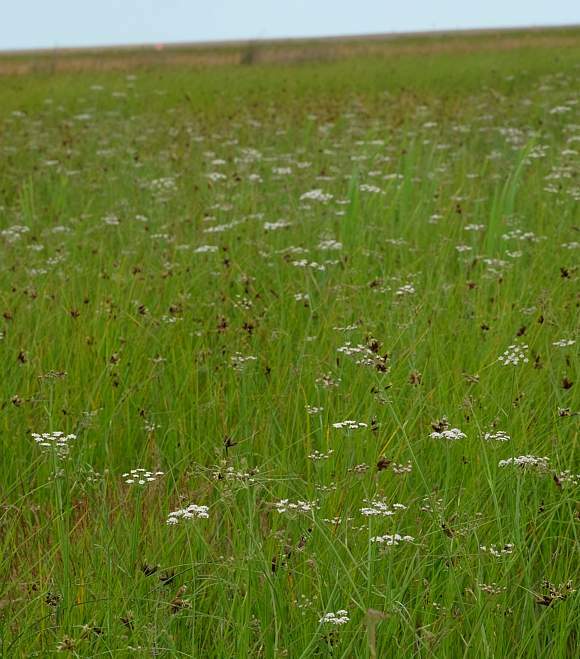 The only Water-dropwort growing in brackish marshes and fens near the sea. Un-like all other Water-dropworts apart from Corky-fruited Water-dropwort (Oenanthe pimpinelloides) but that is stout, has white flowers sometimes washed pink (a deeper pink when not fully opened) and is only found in the South of the UK and in just an isolated hectad here or there, the stems are mostly solid (but some do have hollow stems). 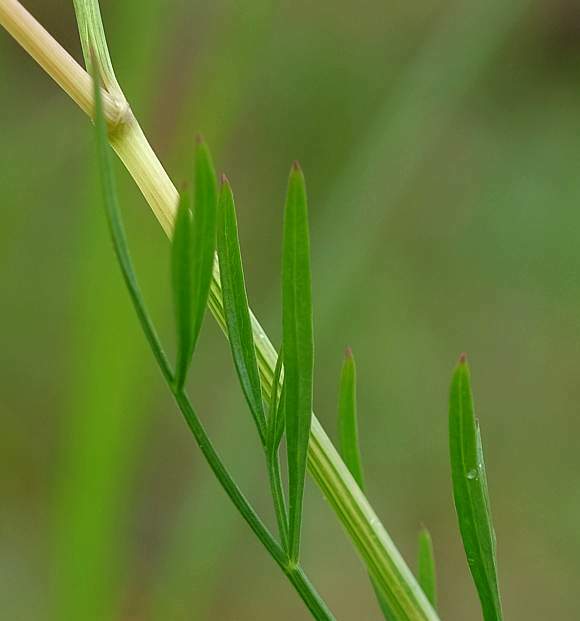 Leaves are few, long and narrow, unlike most other Water-dropworts apart from perhaps Fine-Leaved Water-Dropwort (Oenanthe aquatica), but that has far more leaflets and is not salt-tolerant.